Thinking about what to do on a Sunday morning? Let’s find a nice cafe for brunch, have a cup of coffee, read a book and watch the world goes by. The once-sleepy Tiong Bahru estate seems to be coming alive as more and more cafe – Drips Bakery Cafe, Forty Hands, and Open Door Policy – open in the area. The Orange Thimble cafe at Eng Hoon Street is one of the new additions, and it joins Group Therapy Cafe in my list of new favourite cafes in Singapore. For now, The Orange Thimble remains a nice hidden cafe. My friends have repeatedly warned me not to blog about it, so they are probably plotting a plan to murder me as I type this. You should quickly go down before more food blogs write about it. The art cafe is divided into five sections. Directly behind the main area, there are two small tables in the corridor leading to the backyard. 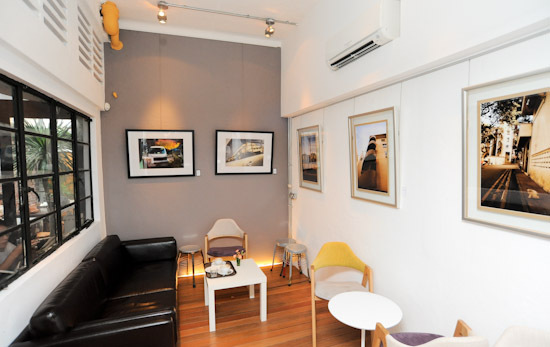 There is also a mini art gallery where you get to sit down and enjoy a cup of coffee while admiring the art pieces. The food at The Orange Thimble isn’t exceptional. In fact, I wouldn’t come here just for the food. But I like the place. It has a nice vibe, and I can definitely see myself coming back to chill out with a group of friends. The Orange Thimble Cafe in Tiong Bahru serves all day breakfast on weekends – English breakfast comes with eggs, sausages, bacon, sauteed mushroom, roasted tomatoes with toast for $11.5. Other items on the menu include: Shepherd’s Pie ($9), Egg Mayo sandwich ($8.5) and English Breakfast Burger ($5.5). better coffee. For the service, food, drinks and prices, no ambience can really salvage anything.